A little over one month ago I raced the Outlaw Half Triathlon as preparation for the full distance Outlaw also held at The National Water Sports Centre at Holme Pierrepont. Coming into the event I had been featured in the ‘Meet the Outlaws' piece on this very website and I definitely felt some additional pressure. My training and taper also took a hit as returned to full-time work four weeks previously. That said, coming into the event I felt relaxed and strong. The registration and race briefing was as you'd imagine very slick and before long my bike was racked, transition bags packed and I was stood in front of a camera giving an interview for the televised coverage. After a short drive into Nottingham we, (my wife and I), arrived at our hotel to find our room was 28.5 degrees and we were in for a very hot and stuffy night. Having set the alarm for 04:15, I went to bed and slept badly. A combination of heat and people that I can only assume were tap dancing in the corridor outside saw to that. But by 04:45 we were off and at 05:00 I was heading towards transition for one last check of the bike and to pull on my Xterra Vendetta wetsuit. Walking to the start I saw fellow Xterra athlete (and eventual winner) Craig Twigg. We chatted briefly before we withdrew into our respective pre-race thoughts. I opted to start the swim on the far left, just behind Craig. Knowing him to be a strong swim/biker I wanted to keep him in sight. Great in theory. Not so in practice. After a few hundred meters I began to lose contact - partly to his speed and partly to the dense pockets of weed. 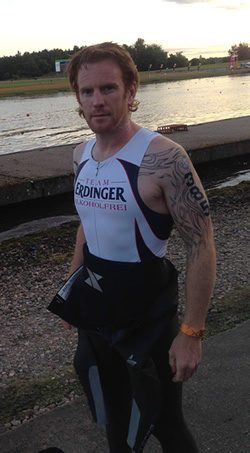 The remainder of the swim was fairly uneventful once I'd settled into my own tempo and I exited the water after 59:49. This came as a shock, I'd been swimming well all year and amongst the leaders coming out of the swim. In the water I had felt strong and relaxed. I knew that to stay in contention I would have to monster the bike. I took the first 30 miles or so fairly easy keeping a steady tempo, and quickly began overtaking some of the faster swimmers. I had no idea of my position on the road and was asking volunteers and marshalls; this proved fruitless as I was told something different each time. The first of the south loops came and went, the section of road joining the southern and northern loops had a fairly strong headwind and powering along I caught sight of two riders maybe two minutes up the road. As I approached the climb of Oxton Bank I was told I was a minute down on the two ahead. 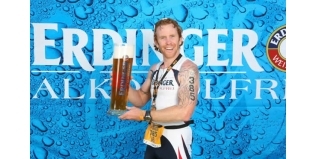 Over the next three miles I drew closer and could see that it was fellow Team ERDINGER athlete Tom Vickery and Phil Moseley. As I got to within 10 meters of Phil's back wheel, I put in an acceleration and went over the top of both. Looking back I could see that both Tom and Phil were pacing off of me - I was quite happy on the front and kept riding hard. Knowing that Tom is a strong runner, I knew I needed to make the last 50km count and so on every climb and turning every corner I accelerated hard forcing him to work harder and within a few miles I had dropped Tom but Phil was still with me. A spectator told me we were 3:30 behind second place and with about 40km to go I was confident I could cross the gap. And after a few more miles I was making the pass and into second on the road behind Craig Twigg. I kept trying to drop Phil but he was determined to keep me in sight and fought back after every acceleration. With about 10km to go I decided to ease up slightly, and recover a little before the run. 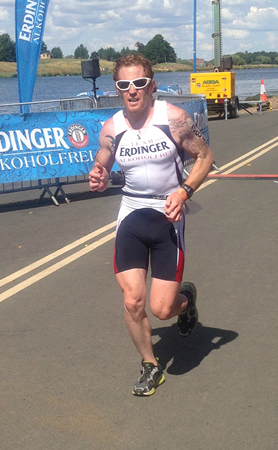 I headed into T2 after a 4:52:53 bike with the third fastest bike split of the day with Phil Mosely right behind me. I got through transition slightly quicker that Phil and out onto the run course, but my second place was short lived as within half a mile he had caught up. I upped my pace to match him and we chatted briefly. After a mile or so his pace was too much for me to match so I had no choice but to let him go. At the nine mile point I was caught by Tom Vickery who offered a few words of encouragement as he passed. I was still moving quite well, but at the 15 mile point all was not well in Camp Alexander; my stomach was sending signals that evacuation was imminent but a quick stop at aid station and I was back on the move. Again I was feeling comfortable, I hadn't walked at all and was approaching the last 10km. With five miles to go on the penultimate lap of the lake, I had slowed to a walk, the edge of my vision was going dark and I knew what was happening to me. With it being such a hot day I had become preoccupied with not cramping (which I am susceptible to), but had forgotten to eat anything. I'd been taking on only water and High5 Zero at the aid stations. I fixed my sights on the next aid station at the top of the lake and walked as fast as I could (which was not very fast). As soon as I arrived I made a start on the jaffa cakes, then bananas and finally a fair bit of cola. I could almost feel life coming back into me and after a few moments to compose myself I set of at a jog. After a hundred or so meters I ventured into a run and I was moving again with only three miles to go. I crossed the line in eighth after 9:34:48 taking second in the 35-39 age group. Initially I was disappointed with my performance, I had come into the race expecting more from myself but now as I write and think back on my performance there are a lot of positives for me to take away and work on for Challenge Weymouth. In the mean time, I' be racing the London Triathlon this coming Sunday. I use the term race in the loosest possible sense!! !